The bride's Irish hankie features linen along with shamrock lace. This magic wedding hankie may be transformed into a baby bonnet. But with a stitch or two I'll be a bonnet for Baby's special day. Have been enclosed especially for you! The bride's Irish wedding hankie may be "magically" transformed into a baby bonnet for future use. 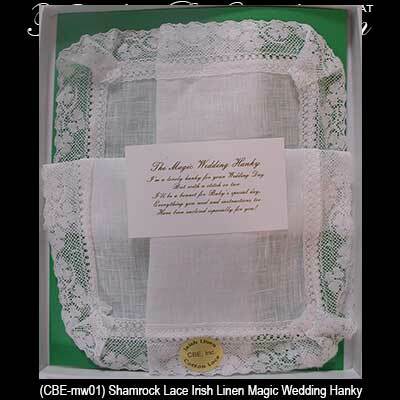 The magic wedding hankie features a 100% Irish linen center along with a shamrock lace border. 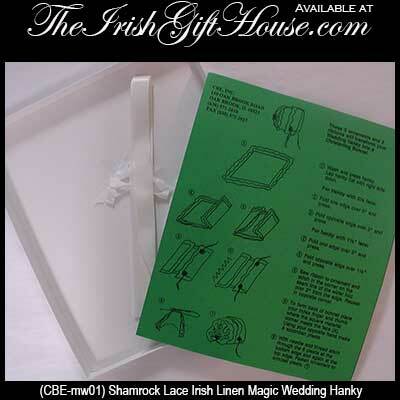 This wedding hankie is made in Ireland and is gift boxed with instructions along with a shamrock history card that is complements of The Irish Gift House. The Irish mother of the bride wedding hankie features linen along with shamrock lace. The Irish mother of the groom wedding hankie features linen along with shamrock lace.